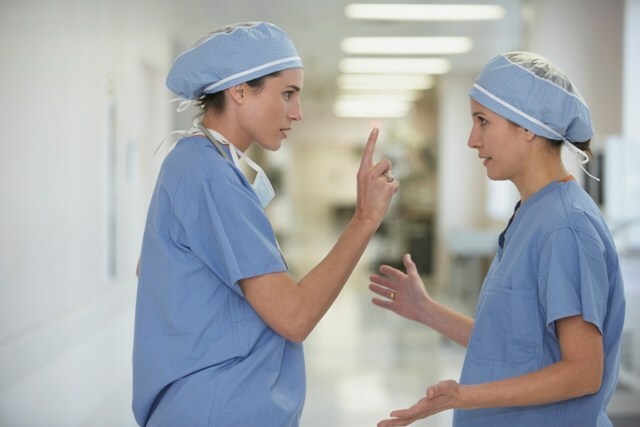 A nurse at a Maryland hospital has a reputation for being a bully. He is difficult, doesn’t do his fair share of the work, and alienates good employees, leading to high turnover in the unit. Sadly, the nurse’s supervisor lets the behavior slide. Does this happen in your organization? It’s all too common for associates in health care — and in other sectors — to avoid having “courageous conversations” that could put an end to this type of behavior. There are a number of excuses. Too little time. Fear of retaliation. Lack of confidence. But you’ll find there are more reasons to have courageous conversations head-on than to avoid them. Like nearly everything in health care, the result can make or break patient satisfaction and health outcomes. Take, for example, a doctor who is regarded as difficult to work with. That doctor may make an incorrect order to a pharmacy, such as telling a patient to take a drug three times a day that should actually be taken twice a day. The pharmacist, tired of dealing with the doctor and fearing a confrontation, may avoid correcting the mistake and just let it go. Studies show that more than 60 percent of medication errors are caused by mistakes in interpersonal communication, and the Joint Commission on Accreditation of Healthcare Organizations notes that poor communication is among the top contributors to events that result in patient harm. If at the end of the day, our goal is to provide high-quality, safe patient care, then we cannot avoid conversations that will help us achieve that goal. A survey of more than 1,700 health care workers found that there are seven crucial conversations that are often absent in health care settings. They are conversations about broken rules, mistakes, lack of support, incompetence, poor teamwork, disrespect, and micromanagement. Data show that only between 5 percent and 15 percent of health care workers step up to have these conversations. While difficult to initiate, the first step to having these conversations is to “start with the heart.” This means to stay focused on what you want the end result of the conversations to be. What do I really want for the other person? What do I really want for the organization? The Maryland Healthcare Education Institute offers training in having crucial conversations. The program Courageous Conversations offers insight on the steps to having effective conversations. To register click here.